Digging some information on Fyrnask is very much the same as with other obscure one-man black metal outfits, basically like pulling teeth. Yet, this is the part of the beauty and the mystique – to hear music from an unknown individual concocted from a creative cocoon deep in the heart of somewhere remote. Going by the promo sheet enclosed by the Swedish cult label Temple of Torturous may not bear a ton of fruit either, since Fyrnask is characterized there as an interesting crossover between Paysage d’Hiver and Fauna, both bands kvlt and obscure enough in their own right. (Even though the names were something I wanted to pursue at some point I confess to not hearing either of them). It was very interesting then, just like it always is, to experience Fyrnask firsthand, without being predisposed to known comparisons and opinions. The work on Bluostar is most cathartic and impressive. Spurred on by periodic outbursts steeped in the Norse tradition, most of the record puts a listener in deep psychedelic funk, not so much nature, but inner soul-searching inspired. If I were to look for my own analogies, other German psychedelic outfits like the earlier Ruins of Beverast and Verdunkeln are good points of reference. At fornu fari is probably one of the most meaningful intros to an album, as it intends to preview what is about to unfold. Beginning with jiggly stillness of gello-like mass, At fornu fari continues to disturb this creature with distorted, longing, sometimes folky single guitar touches, until the whole thing marches off to the Norsk blast of the most impressive Evige stier. The unsettled atmosphere continues with cavernous depths opening their chasms all around depressive bits and vocals switching from dejected shrieks to clean. The end of this jabbing fight between the more classic black metal with distorted guitar lines and depressive dense atmosphere creates one seemingly final convulsion before an acoustic interlude announces the win for serenity … only to have madness go for one last lunge at the throat with tremolo gliding riffs. Ein eld i djupna is more of a traditional black metal blasting piece, but even its melody and riffs are one desperate cry for help, guitars first creating and then pressurizing the atmosphere. Bluostar is full of Deathspell Omega little inserts from Russian monastic choirs speaking from catacombs (Eit fjell av jern) and German whispers (Die firnen Tiefen). In this way Fyrnask music is more than plain anger and chaos. After the noise experiment of Bergar drones off for four minutes, the resonating guitars bring out the bear stomping heaviness, but this grizzly has a wounded and bleeding heart. The grief finally blows overboard in two culmination closing pieces Ins Fenn and the title track. Bluostar itself is at first also droning and static with the rolling sound of bells calling the listener to participate in one final parting prayer send-off for someone, no matter dead or alive, but who is utterly dejected, given up on life and rudderless. Once Bluostar was over I had a very thick unsettled dense feeling flushing over me, and I want to predict you will have it too. 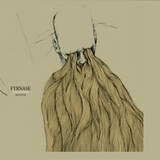 German on paper, the individual behind Fyrnask, Fyrnd, breaks the album in two, with the first part being in some Scandinavian language (Norwegian or Swedish) until settling into German from Die firnen Tiefen going forward. This may be meaningful, and all of my interpretations of Fyrnask above may not hold any water, but I came away thoroughly awed, even if the understanding of these proceedings is my own and my own only.